Saudi Perlite lndustries, a pioneer in the field of thermal and cryogenic insulation, manufactures expanded perlite at one of the biggest facilities of its kind in the region. The Riyadh-based factory is part of AlMojel Trading and Contracting Company and has a production capacity of 12,000 tonnes a year. Expanded perlite that is supplied to Saudi industries and other Gulf and African markets includes insulite for building and insulation; looslite for insulation of walls; cryolite for industrial purposes, and agrilite for agricultural purposes and as a soil conditioner. Expanded perlite is used in a wide variety of applications. Having outstanding insulating characteristics and being of light weight, it is widely used as loose-fill insulation in masonry construction. Perlite is also ideal for insulating low temperature and cryogenic vessels. In horticultural applications, perlite is used throughout the world as a component of soil-less growing mixes where it provides aeration and optimum moisture retention for superior plant growth. The industrial uses of perlite are diverse, ranging from high-performance fillers for plastics to cement for petroleum, water and geothermal wells. Expanded perlite is also used as an abrasive in soaps, cleaners, and polishes, and in a variety of foundry applications that utilise its insulating properties and high heat resistance. Perlite is a glassy volcanic rock originating from lava of strictly determined chemical composition and crystalline water content. The perlite ore is crushed, dried and graded. When perlite ore grains are abruptly subjected to immediate heat near to their softening point (870 degrees C) the combined water rapidly vaporises causing them to expand four to 20 times their original volume. The expansion process creates countless air voids in the grains which account for the lightweight and excellent insulating properties of expanded perlite. Insulite, a key Saudi Perlite product, contains countless tiny air cells which account for its excellent thermal insulation and light weight. This fire-resistant product is noncombustible. It has a very high fusion point and no flaming combustion. Insulite provides excellent noise absorption, superior to that of number of commonly used building materials, reducing sound transmission. 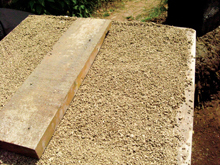 Insulite concrete aggregate combined with Portland cement and water produces lightweight insulation concrete used for lightweight roofs, floor fills, oven insulation and interstitial floors in hospitals. It can reduce sound transmission between partitions. Cryolite has many properties which make it an ideal cryogenic insulation: It is free flowing which eliminates voids in cold box applications, is heat resistant, has good availability, is chemically inert and K value stable and does not change with time. It is also inorganic, lightweight and less expensive than any other similar insulation material. It is used in building cryogenic storage vessels, low temperature storage tanks, shipping containers and cold boxes. Fine Agrilite can be used alone as a seed starting medium or it can be mixed with shredded peat moss. It is used in the production of greenhouse seeds initially sown on the surface of peat moss. An Agrilite seed cover is applied over sown seeds and this procedure takes place when the sun is at its fiercest and temperature is high. This product is used in filled bags to produce vegetables, flowers and strawberry as it provides constant moisture around the roots at all times. Agrilite is an ideal material for use in maintaining a thermal and moisture barrier around stored bulbs, roots and tubers. It is used as a soil conditioner in landscaping (outdoor gardens) to improve soil aeration and drainage, decrease soil compaction and increase water holding capacity.